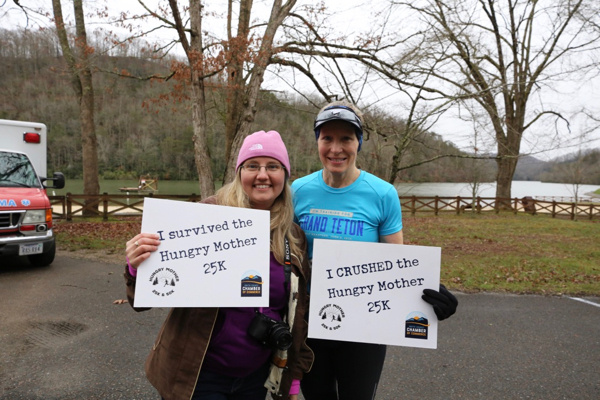 It had been two years since my last trail race, but once I learned about the Hungry Mother 25K, I knew I wanted in on the action. Hungry Mother State Park is near where I grew up, and my husband Bill and I have enjoyed running the well-manicured trails around the lake for several years. 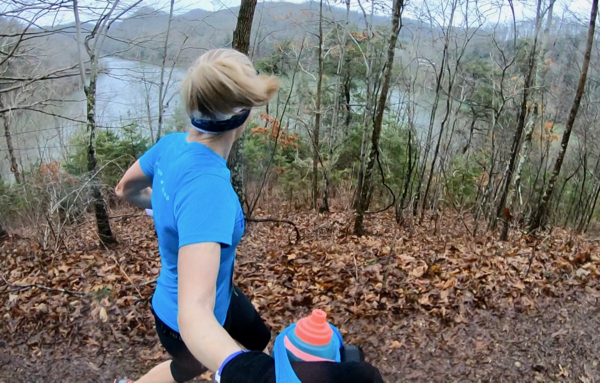 The highlight of our run has always been the mile-long climb up to the peak of Molly’s Knob. 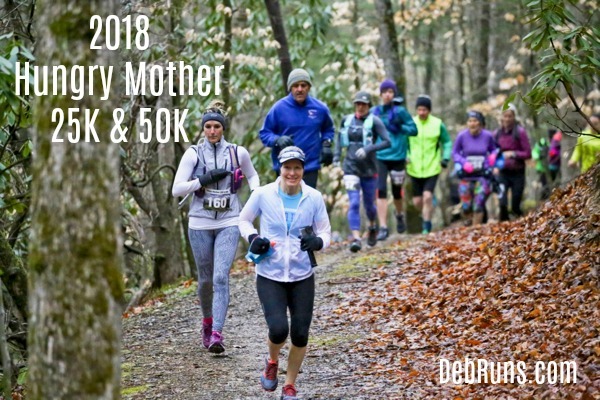 One of the first thing people comment on when I talk about running at Hungry Mother State Park, is the park’s unique name. Legend has it that around 1750 when Native Americans from area tribes attacked the recently settled encampments, Molly Marley and her young son were among the survivors who were then taken back to the marauders’ tribe. Eventually, Molly and her son escaped and lived in the wilderness on wild berries while trying to find their way back to their settlement. When Molly eventually collapsed from exhaustion, her son continued on following a stream until he found help. Weak and exhausted himself, the only words he could utter were, “Hungry, Mother, hungry.” The settlers eventually found his mother who had succumbed to exhaustion and starvation. Today the mountain where she was found is called Molly’s Knob and the stream the little boy followed is called Hungry Mother Creek. 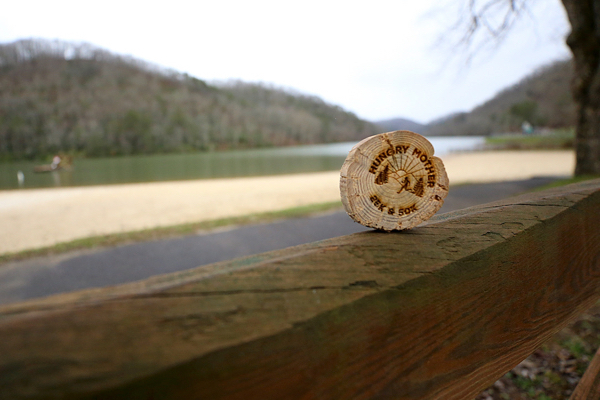 Hungry Mother State Park, built by the CCC (Civilian Conservation Corps), opened in June 1936. 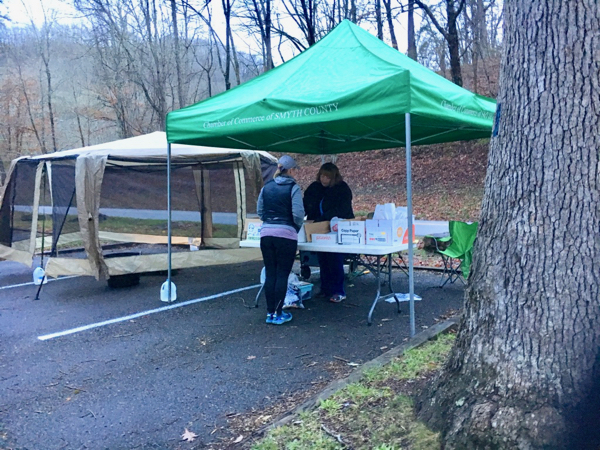 The Hungry Mother 25K, hosted by the Smyth County Chamber of Commerce, benefits Smyth County’s Imagination Library, helping children throughout the county. When choosing races to run, it’s always a bonus to know that the proceeds will go to a good cause! 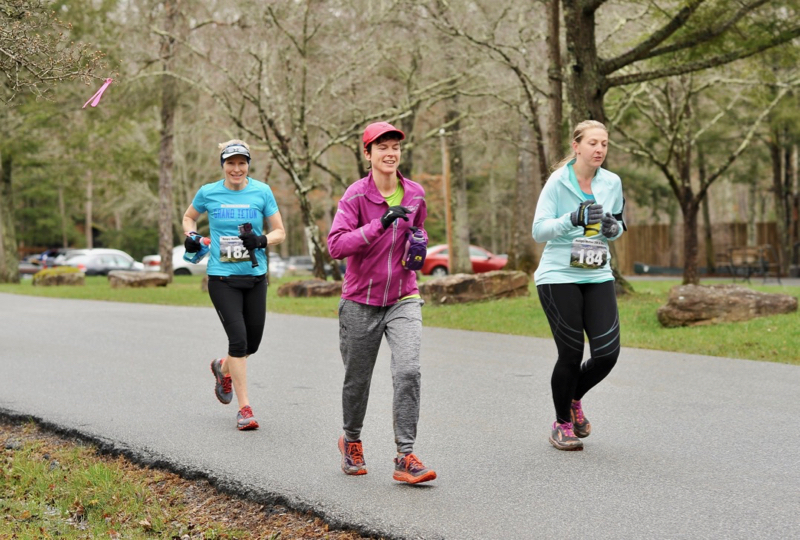 The Hungry Mother 25K consists of one large loop around the lake; those wishing to run the 50K repeat the loop a second time. For the purposes of this recap, I will be focusing solely on the 25K since that’s what I ran. I would describe the course as quite hilly, but not particularly technical. There was a total of 3,500 feet of elevation gain on each loop; however, the trails were well maintained and mostly free from roots. 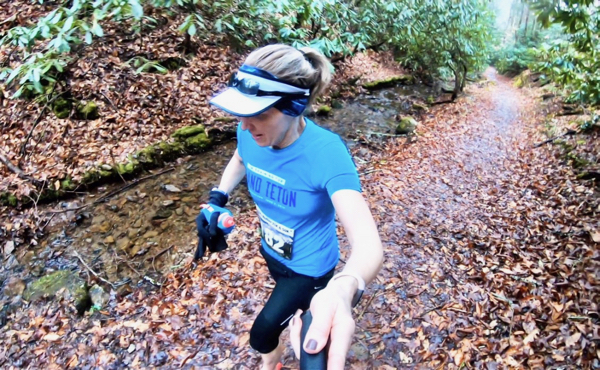 There were loose rocks and leaves along the course, but that’s to be expected on a mountainous trail. 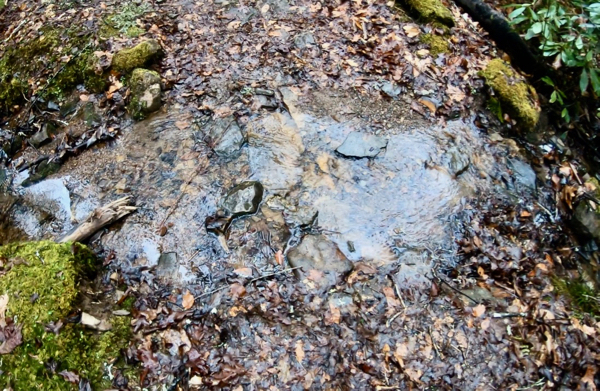 There were only a couple of water crossings, one of which I plowed right through, deciding that I’d be more likely to get completely drenched if I fell off the slippery log while trying to balance my way across it. I was surprised that despite the overnight rain, it was relatively mud free with the exception of a couple of spots. The mountain trails were well marked with signs and I was happy to not fall victim of getting lost! Bill and I left my mom’s house around 6:45 AM for the drive across Walker Mountain to Hungry Mother State Park. About a mile into our drive, I realized that I still had my eye glasses on and we had to turn around for me change into my contacts. Had I known the sun wouldn’t come out and I wouldn’t need my sunglasses, I could have worn my eyeglasses; but ever the optimist, we turned around so I could change. Once we arrived at Hungry Mother, we were able to park close to the packet pickup area. I was in and out of our Jeep in a flash, and with my packet in hand, I hopped back into our vehicle to stay warm until the 7:45 mandatory pre-race meeting. I inspected the race shirt, approved of it’s color and design, posted a picture to Instagram, and carefully pinned my bib onto the shirt I would be wearing for the race. 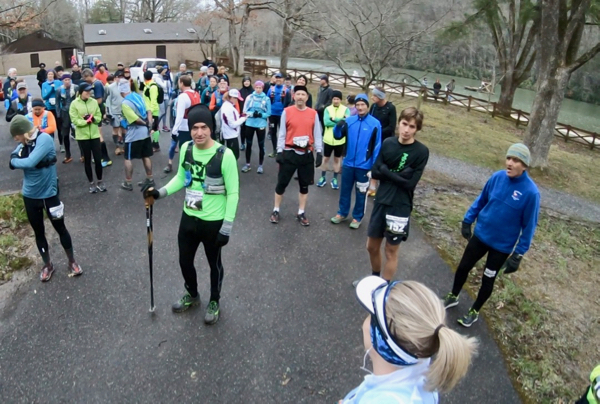 Our pre-race meeting consisted of about ten minutes of trail explanations and expectations given by co-race directors Tim and Lori Ringley, and park manager Nate Clark. My head was spinning with scary thoughts as I heard discussions of left and right turns, cones blocking trails, pink ribbons, slippery bridges, getting lost, and falling in the mud. At least no one mentioned recent bear sightings! As promised, promptly at 8 AM the race started. Forgetting that this was not a chip timed race, I waited until I crossed the starting line to start my Garmin (affiliate link), something that came back to bite me later in the race. Escorted by a park police vehicle, we left the park entrance, turned right onto Route 16 and ran a few hundred yards to our first taste of the trails. 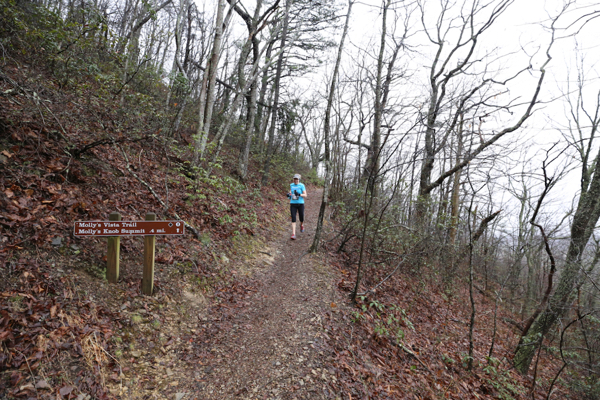 From the highway, we turned left onto Stone Lick Trail which lead us to Clyburn Ridge and Clyburn Hollow trails where we circled the ridge of the mountain. It was on Clyburn Ridge Trail that I saw Bill for the first time. Now that he temporarily can’t run, he’s willing to settle for the next best thing and play paparazzi for me at my races (click here to see more of his amazing pictures). 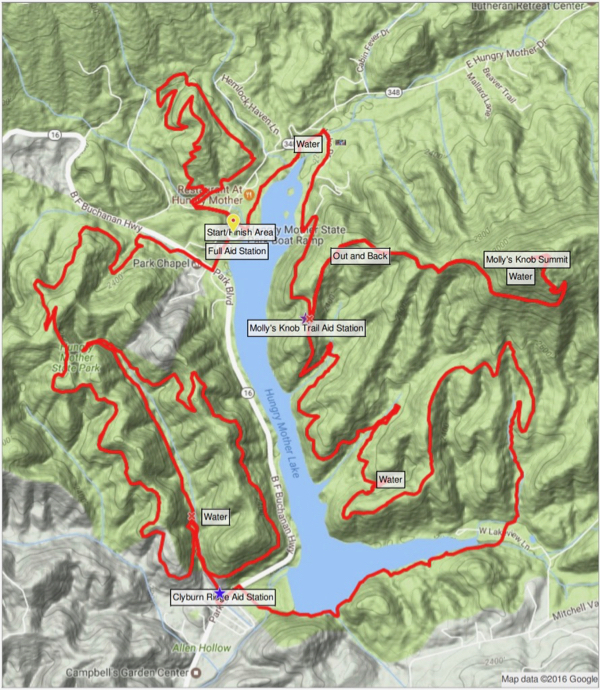 This race in particular had him excited for hiking on trails on the west side of the lake that we’d never explored. 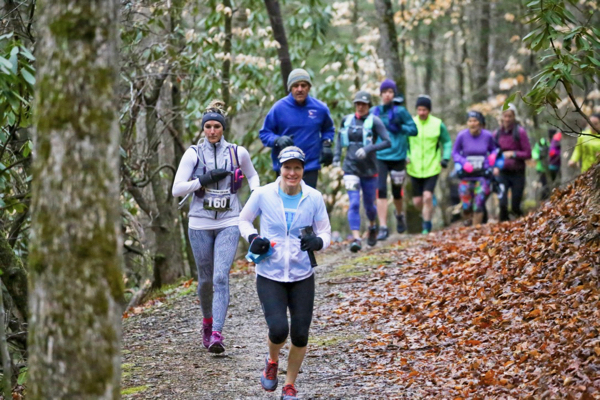 As we ran along the trail, runners settled into comfortable paces, even resorting to walking the steep uphills which brought a smile of relief to my face. On the first steep climb, I felt my right Injinji sock (affiliate link) heel slip down to the arch of my foot. Within another quarter mile, the left sock had done the same. No matter what socks I wear, this seems to happen and drives me nuts. Rather than stopping and pulling my socks back up, I continued with my socks half on for the remaining 14.6 miles; and surprisingly, I suffered no ill effects, not even a tiny blister. I had forgotten to pack my gaiters (affiliate link), so I did get a small amount of debris in my shoes, but nothing that bothered me enough to stop and remove it. Within another half mile I got too hot and removed my jacket, tucked it inside its self contained zippered case and slipped it on my wrist; all while running. A group of runners fell in place behind me and I enjoyed listening to their conversation, throwing my own thoughts in here and there. I offered to let them pass, but they seemed to think that I knew what I was doing and were happy with the pace. Occasionally, another runner would pass, but for the moment, our little band of newly made friends – Deb, Megan, Nicki, Don, Stephanie, and Eddie – enjoyed our time getting to know each other. As we passed Bill for the second time, he commented that I had my own posse. As we approached the end of the network of trails on the western side of the lake, I anticipated seeing our car at the first aid station where I knew I could drop off my white jacket and mittens. As I slipped off my left mitten, my bundled up jacket slipped off, too, and that little white football catapulted across my head and down over the embankment below the trail. Our posse stopped in disbelief and stared down the mountain at the bright white object laying amongst the dead leaves and twigs. If it hadn’t been an expensive Brooks jacket I might have left it to pick up later, but I didn’t want to risk losing it, so I started down the hill to get it. At that moment, Don said, “I’ll get it,” and instantly became my hero. The rest of the pack continued on as I stared in amazement that he’d risk falling or turning an ankle as he carefully picked his way down the embankment to retrieve the jacket of a stranger. I was so flustered I turned off my watch (timing mistake number two), and I didn’t even think to take a picture! Once at our check point, Don saw me run to drop my stuff on the hood of my car for Bill to get when he made his way off the mountain, and asked if he could leave his hat, gloves, jacket, etc. on there, too. It was the least I could do and I gladly said, “Of course!” Later we devised a plan that I would leave his items at bag check since he would be continuing on for the 50K and I’d be leaving long before he finished. After making sure I’d officially checked in at the Clyburn Aid Station, I crossed the highway and followed the paved parking lot road back to across the bridge and onto Lake Trail. I opted to skip stopping in at the bathrooms (I know, who am I?) because I could see the others in my posse up ahead and I made it my mission to catch them. It took me a couple of miles, but I did it! 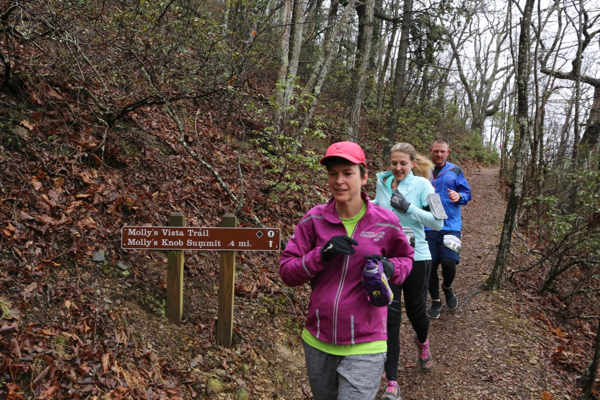 We ran along CCC Trail, Lake Trail, and Ridge Trail before coming up to Molly’s Knob Aid Station where there was a bit of confusion about getting all of our numbers checked off because so many of us were coming into the aid station at once. After making sure my number was correctly recorded, I grabbed half of a peanut butter and jelly sandwich. I’d taken a Honey Stinger gel (affiliate link) about four miles earlier, and a portion of the sandwich seemed like about the right amount of fuel for my climb up to Molly’s Knob. 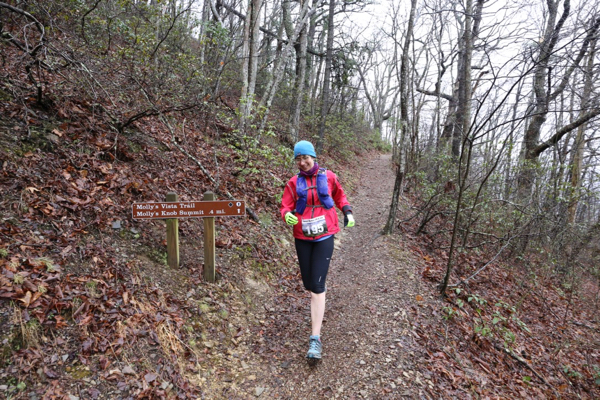 I’d forgotten that the next portion of the course on Molly’s Knob Trail and Molly’s Knob Vista Trail would be an out and back (better described as an up and down), so I was surprised to see a runner headed towards me. I thought she’d forgotten something at the aid station and almost asked if she was okay. By the time the second runner came my way, I remembered and cheered for the speedier runners. 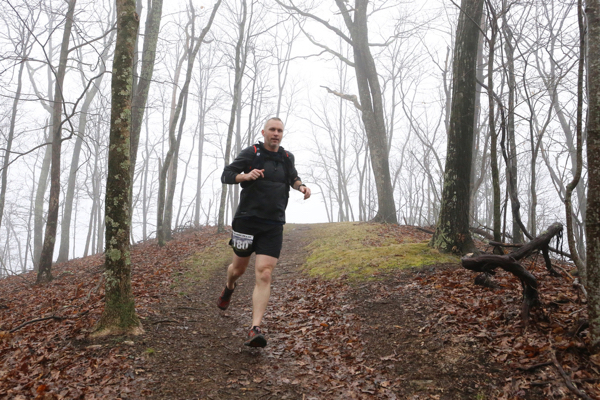 I won’t lie, there was a lot of walking as I worked my way up Molly’s Knob, but that seemed to be par for the course and very few runners passed me. The higher we climbed, the foggier, breezier, and colder it got, and I started to miss my jacket and mittens. 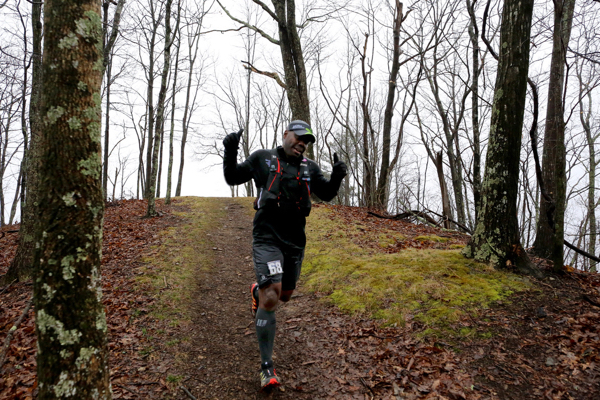 I knew that once we got back down the mountain, I’d be okay and that this was a trail race after all, and not for the faint of heart. As we made the slow climb up the mountain, I struck up a conversation with a gentleman named Mark who was running the race with his wife Anita. 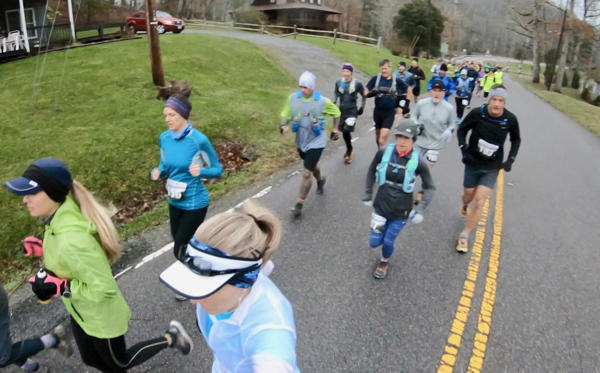 At a particularly steep switchback, a familiar voice ahead of me said, “Don’t you ever look up?” I looked up to see Bill, who had been snapping pictures of runners on their descent from Molly’s Knob. He later told me that out of kindness, he hadn’t photographed anyone walking up the mountain. After a quick kiss, I continued on with a renewed excitement of summiting Molly’s Knob. At the top of Molly’s Knob, I took a few minutes to take in the view and double checked that my number had been properly recorded. 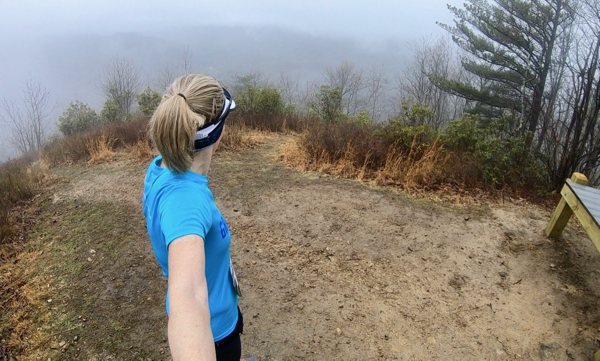 Running back down the two Molly’s Knob Trails was a lot more fun than running up, but I remained cautious remembering the time I ended up at urgent care after twisting my foot and falling when I stepped on a leaf-covered rock on Lake Trail. Stephanie, from my earlier posse, flew past me as she shouted that she loved running down hill! 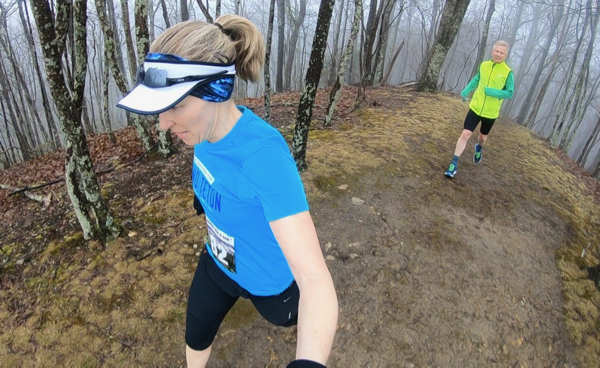 As we made our way down the mountain, I struck up a conversation with another runner named Rebecca. 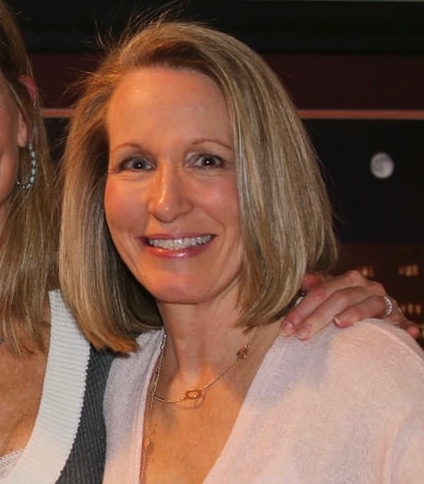 She happened to mention that she was from Northern Virginia and when I asked where specifically, it happened to be my community. After chatting a while longer we discovered that we know several of the same people and live only about a mile from each other. How cool is it that we met on a mountain trail 325 miles from our homes. After passing the Molly’s Knob Aid Station a second time, we continued on to Molly’s Knob Trail Head and then onto an asphalt road. While chatting, we almost missed our turn onto Lake Trail, but two ladies behind us called for us to turn around (pictured above with Don, my jacket rescuer). 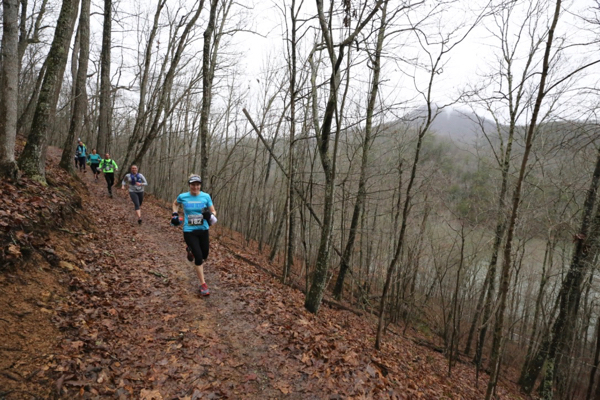 We’d missed the trail leading off below the road and fortunately the other two runners were familiar with that portion of the course. Their names were Brandi and Joanne, and after chatting with them, I realized that I knew Brandi’s in-laws – what a small world! 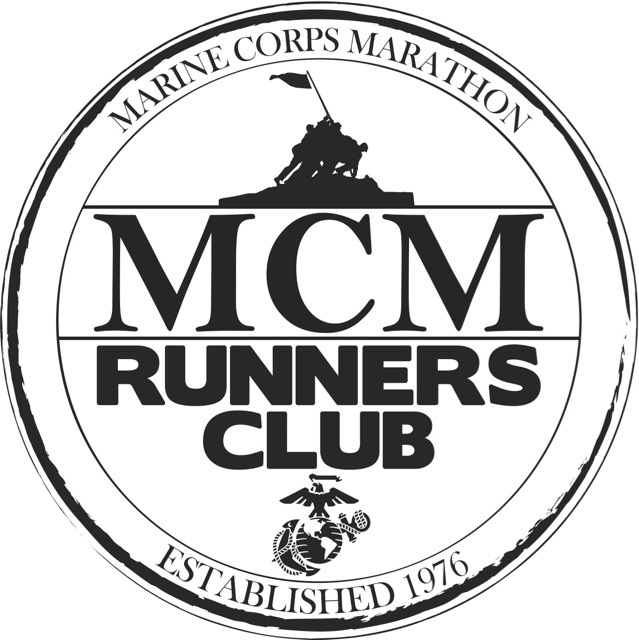 As we ran past the picnic area I contemplated stopping at the restroom, but passed once again, this time because I was having too much fun chatting with my newest group of friends and didn’t want to have to finish the race alone. I did pause long enough to take another energy gel and even figured out how to open the bear-proof trash can with my foggy runner’s brain. I caught back up with my group and the four of us stayed together for most of the remainder of the race, jockeying back and forth at a few different sections. As one of the three oldest runners in the race, I felt strong and felt like I held my own with the younger runners by finishing 27th out of 45 25K finishers. Other than failing to hit that silly little number of breaking 3:30, I met all of my goals: have fun, finish the race, and avoid injury. Right after I crossed the finish line, Bill told me that he had someone he wanted me to meet. He’d made a new friend, Sarah Gillespie, while I was out running and she just happened to have had my mom as her first grade teacher. Sarah is the executive director of the Smyth County Chamber of Commerce and was busily taking pictures of runners holding cute signs after they finished the race. After collecting my really cool homemade finishers award, I grabbed my free boxed lunch provided by Sisters’ Cafe. Sisters’ is one of our favorite places to have lunch when we visit Marion so I was super excited to see they were a sponsor. I’d purchased a lunch for Bill as well; however, I was so cold and ready to go home that we grabbed our lunches and drove home. Once back at my mom’s house, there was plenty of delicious food to divide amongst the three of us. 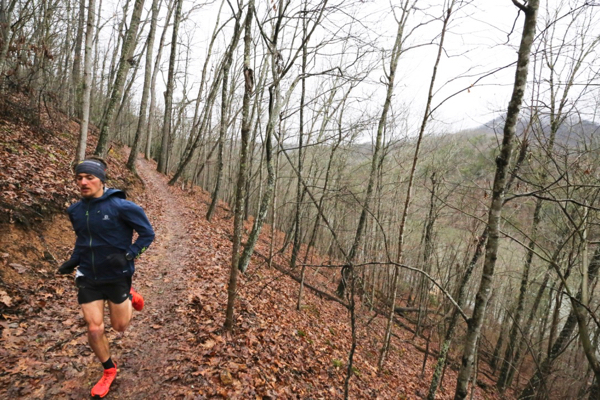 The winner of the Hungry Mother 25K was 24-year-old Zachary Russell of Bristol, VA. He finished with a time of 2:03:33 (7:57 pace). 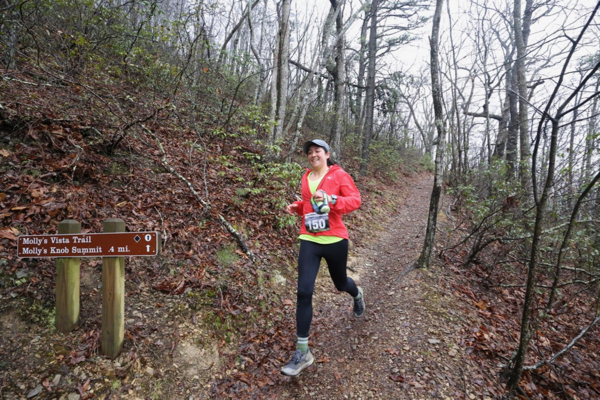 The first place female finisher of the Hungry Mother 25K was 24-year-old Leah Ling of Durham, NC who finished third place overall with a time of 2:27:22 (9:29 pace). We were long gone by the time the 50K runners finished, but it’s important to acknowledge 43-year-old Kit Linton of Durham, NC who won the race with a time of 4:59:25 (9:38 pace). 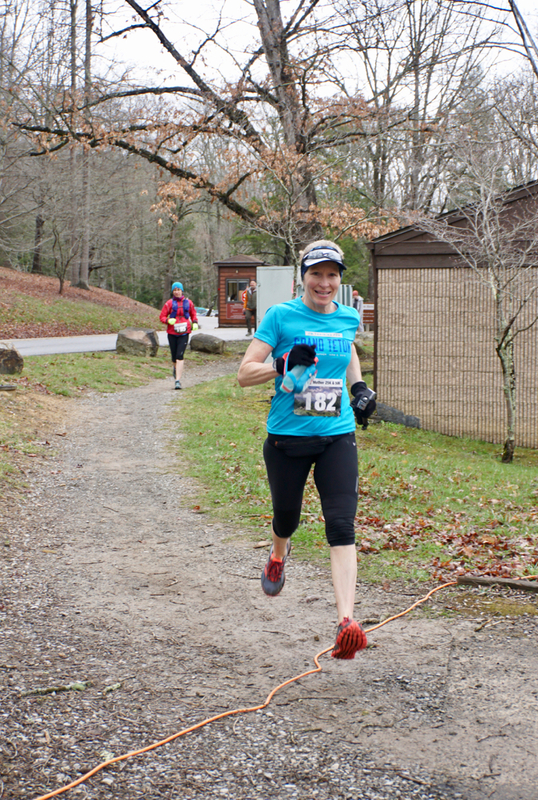 The first place female (and fifth place overall) was 34-year-old Lindsay Skinner of Spring Lake, NC with a finishing time of 6:15:26 (12:05 pace). Later in the afternoon, and just as forecasted, it snowed for several hours. Sunday morning, on our way back home, we crossed Walker Mountain on our way to the interstate and stopped at the top long enough to capture this beautiful picture. As lovely as it was, I’m glad the snow held off until after the race. The race organizers and volunteers were amazing and put on a great race. 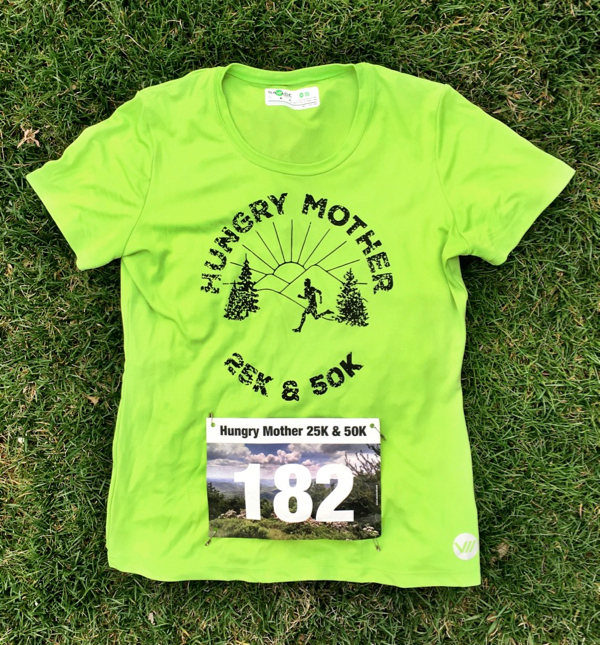 I’m so glad that I chose to run the Hungry Mother 25K even though I’d only ventured out on one trail run in the last two years, and that run happened to be last summer on the easier flat trail around Hungry Mother Lake. It’s a race I’d love to run again next year, especially now that I’m familiar with the entire course. 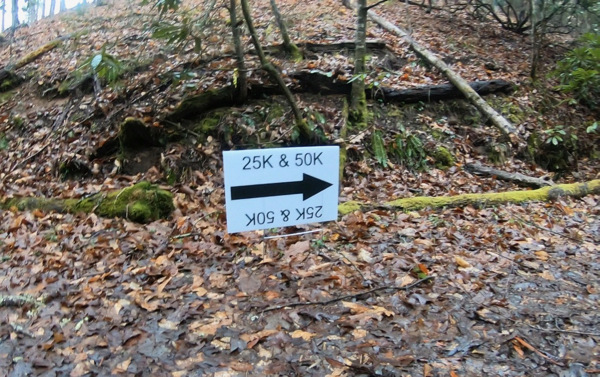 If you’re looking for a fun racecation to a quaint park nestled in the mountains of Southwest Virginia, consider adding the Hungry Mother 25K or 50K to your bucket list. Runners are kicking up their heels for this race! 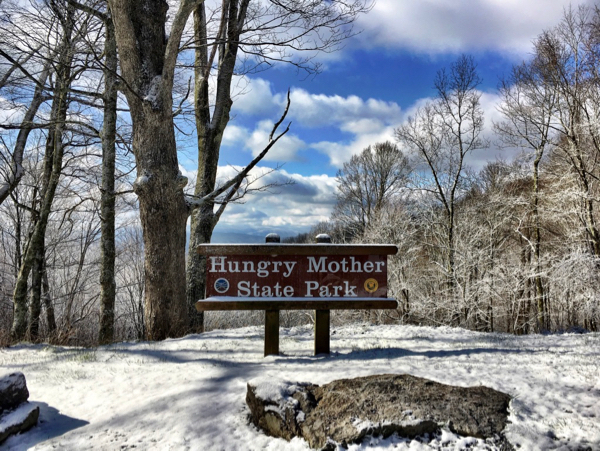 Have you visited or heard of Hungry Mother State Park? 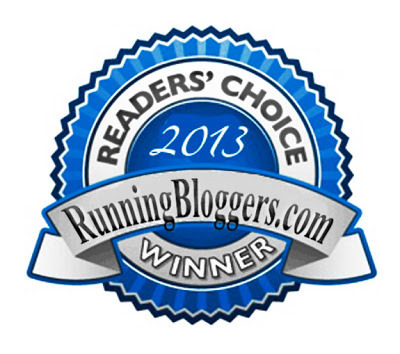 Do you enjoy trail running? 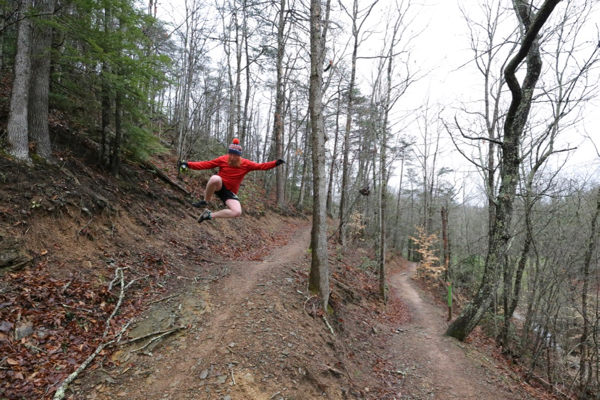 If so, where was your last trail run? Thanks, Deborah! 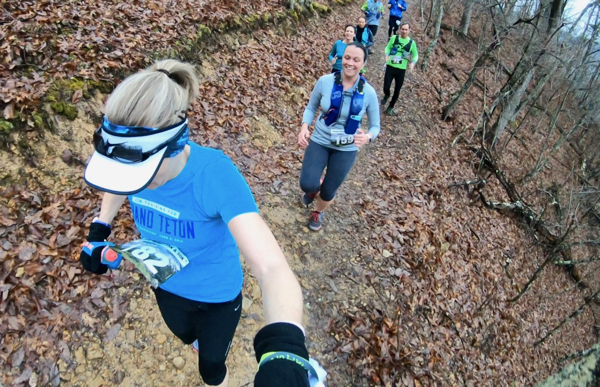 If you haven’t done a trail run/race, you should give it a try to see if you like it. Start shorter and less hilly, though! 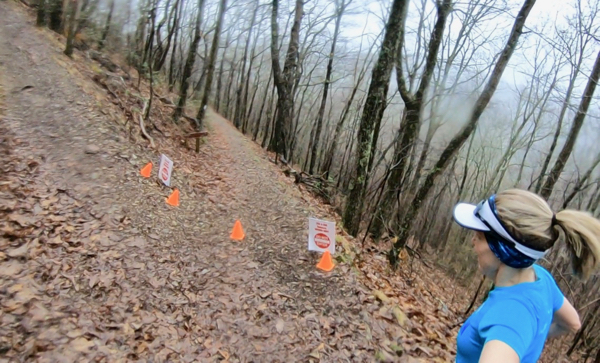 Looks like a beautiful trail system for running! If I could be guaranteed of no tree roots to trip me up, I’d run trails all the time! Congratulations …looks like you had a fun time! 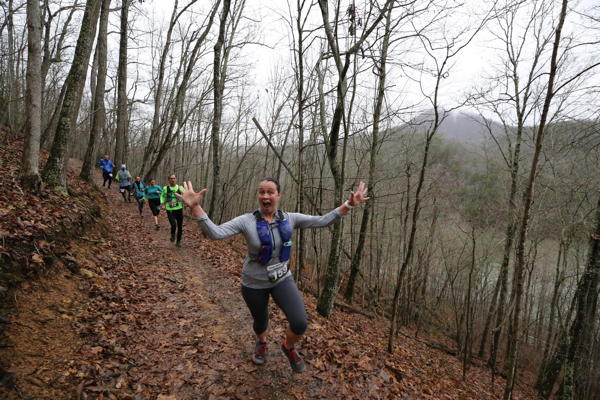 And look at you now, training for your first trail 25K! Somehow I missed this one and found the new post in my email. What great photos, I especially love the snow covered one. The people we meet are sometimes the best memories of races.